Technical education around the world is facing new challenges, opportunities and different expectations from stake holders. In today’s era, the unique challenge is educating the technologically savvy generation. The technical education need to be relevant to the rapidly changing landscape of industry, businesses and economics in new ways so as to create value.Keeping this in view, Shree H.V. 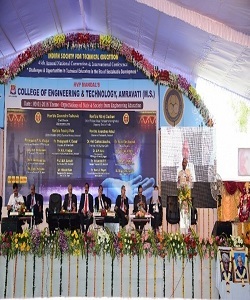 P. Mandal’s college of engineering & technology organized the 45th ISTE National convention & International conference during9th -11th Jan.2016 which aimed to provide common platform for promoting and unfolding new dimensions in the field of technical education. On 9th January 2016, the national convention was inaugurated by the hands of Honorable Shri Devendraji Fadvanis, chief minister of state. 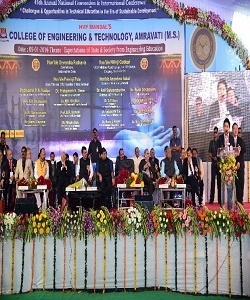 For the inauguration ceremony of Day 1,Hon’ble Pravinji Pote, Guardian minister, Hon’ble Anandrao Adsul member of parliament, Dr. Anil Sahashrabudhe, Chairman AICTE, Dr. Pratapsinh K. Desai, President of ISTE, Dr. S. P. Kane, Vice chancellor of RTM Nagpur University, Dr. Mohan Khedkar, Vice chancellor SGB Amravati University, Dr. Vishram Jamdar, Chairman of Governing council VNIT, Hon’ble Padmashri Prabhakarraoji Vaidya, Secretary of H.V. P. M., Dr. Madhuritai Chendke, Dr. S. P. Chendke, Dr. A. B. Marathe, Dr. M.E. Shelke were present on the dias. Felicitation of Hon’ble Devendra Fadnavis (Chief Minister) was done by the hands of Padmashri Prabhakarrao Vaidya along with dignitaries on dais. Welcome address was given by Hon’ble Padmashri P. A. Vaidya. Dr. Pratapsinh K. Desai delivered presidential address about national convention. 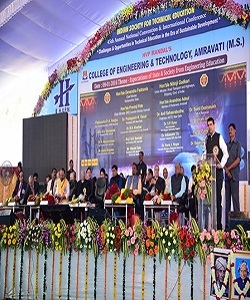 On the occasion Shree Devendra Fadnavis, in his address discussed the national issues of producing skill full engineers & technical manpower to accept the challenges posed by fast changing technology. The kind of statistics which he has given on various parameters during his speech showed his deep study & concerned about the subject. He also talked about youth empowerment & job opportunities in future due to make in India initiative. Fellowship awards of ISTE were distributed to Dr. D. Vishwanathan, Dr. Vijay Tulshiram Ingole, and Dr. Subhash Mahajan by the hands of Hon’ble Devendra Fadnvis. The special vote of thanks to Hon’ble chief minister was given by Dr. A. B. Marathe, Principal H.V.P.M’s COET. MOU was also signed with Japanese Mr. Isamu Koyama, managing Director K136, and Japan in front of chief minister. A grand felicitation of Hon’ble Nitin Gadkari was done by the hands of Padmashri Prabhakarrao Vaidya along with dignitaries on Dias. 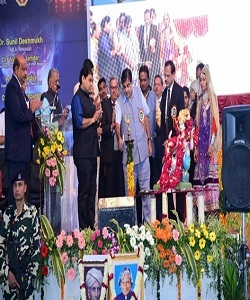 The inauguration of International conference was done by Hon’ble Nitin Gadkari bylighting the traditional lamp. Welcome address was delivered by Dr. Madhuritai Chendke, Secretary, and HVP Mandal. Panel discussion was followed by technical session with paper & poster exhibition on themes. 3) Sports and show business – a new vistas of Engineering Education. Near about 100 ISTE delegates from different corner of India were presented papers on these themes. 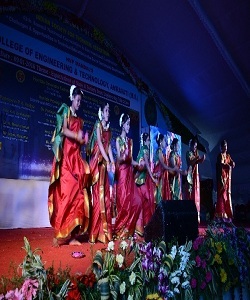 In the evening cultural program was also organized by H.V.P. Mandal’s for the delegates of ISTE and students of HVPM & for faculties of different institutions of India. Different traditional dances from the states Himachal, Maharashtra, Punjab, Meghalaya & Goa was presented. The cultural program was followed with delicious dinner at night.